i cater to the most popular form of listening. so far, i’ve found that mixing to headphones and then listening on speakers has worked. i’m not rick rubin, but neither is anyone else who is not rick rubin. If you haven’t had a chance, go through the comments and read them. There are some really interesting perspectives. And definitely leave your thoughts as well. Discussions are always helpful. Let’s talk about some benefits to mixing with headphones. As you read through the comments, you’ll notice that there’s one central theme. Most people that use headphones do so out of necessity. If they had a properly treated acoustic environment with nice studio monitors, they would likely use those. But since they don’t have a great mix room, they revert to headphones. I’ve talked quite a bit on acoustic treatment in your home studio. It’s absolutely a necessity for both recording and mixing. However, some people just can’t afford to properly treat their entire room. They may only have enough money to treat a portion of the room to allow them to get a nice, clean recording. When it comes to mixing, though, frequencies are flying all around the room. There are huge peaks and dips in the frequency response of the room itself. (My room, for example, has some serious issues in the 120-160 Hz range.) All this craziness can make it very hard to get consistently good mixes. Acoustic treatment will help “flatten out” the frequency response of the room. Headphones, on the other hand, don’t need acoustic treatment. They sound the same every time. Most people would agree that you can hear more detail on headphones than on studio monitors. I always use headphones for editing, for example. I want to make sure I don’t miss any pops or clicks in cross-fades, etc. When mixing, headphones can give you an added amount of detail with things like EQ, compression, panning, effects (reverbs, delays), level balance, etc. Obviously, many of us live with other people, or in dorm rooms or apartment buildings. Also, many of us have day jobs, which makes “studio time” synonymous with “late nights.” When I first got the studio monitors I have now, I was living in an apartment, and I could only work on music at night. I was so bummed, because I never had a chance to try out the monitors, since they would wake the neighbors. One of the reasons we get big 6-inch or 8-inch studio monitors is so we can actually hear what’s happening in the low end. Headphones typically cannot reproduce the lows the same way that studio monitors can. After all, they’re small little mini-speakers, so we can’t expect them to thump like a 12-inch subwoofer. Sometimes headphone manufacturers make up for this by boosting the low end in their headphones. This isn’t necessarily wrong, but you need to keep this in mind when mixing on headphones. Since they probably don’t have a super-flat response, you need to know what the headphones are doing to your mix as you make your mix decisions. When you’re mixing on studio monitors, when you pan something hard right, you’re still going to hear it in your left ear. The sound will travel from the right monitor, past your face, and into your left ear. With headphones, this doesn’t happen. If you pan something hard right, it’s only playing in your right ear. This isn’t necessarily bad, but you might choose to pan things differently when mixing on monitors vs. headphones. Also, the “center” of your mix is very different on headphones. When listening on monitors, anything panned to the center sounds like it is in front of you, between the monitors. With headphones, anything panned to the center sounds like it’s in the middle of your brain. This may seem like a non-issue, but it can effect how you handle things like lead vocals, bass, kick, snare…anything panned to the center. The lead vocal might sound great on monitors but WAY too loud in the headphones. Gotta find a balance somehow. There’s something awesome about listening to a mix blaring loudly on a nice set of studio monitors. No matter how good you are at mixing on headphones, you’re really missing out if you never listen to your mixes on monitors. You need to be able to crank it up and enjoy. For one thing, it’s just fun. Secondly, it’s a great way to check for issues in your mix that you can’t hear at lower volumes with headphones. A word of caution, don’t listen at super-loud volumes, whether you’re using monitors or headphones. Listen at a “reasonable” level and protect your hearing. So, that’s my take on mixing with headphones. I don’t think there’s a right or wrong answer here. You really need to evaluate your current gear, room, experience, and budget. If you can treat your room and get some nice monitors, great! If you don’t have a dedicated studio room, or if you’re constantly mixing in different environments, it might be worth your while to get some nice headphones. What do I do? I’ve had the pleasure of moving several times over the last year, and each room I’ve used for my studio has sounded very different from the one before. Since they’ve all been temporary, I haven’t been able to really dive in and treat them. So, I use a decent amount of acoustic treatment. However, the room still has some issues. So I use headphones to give me a “room-less” mixing environment. I mix for a while on headphones, then I mix for a while on monitors. I’ve found that if I make major decisions with headphones and then “check” them on the monitors, it tends to translate much better than the other way around. The biggest take-away point here is that you need to learn how YOUR system sounds. 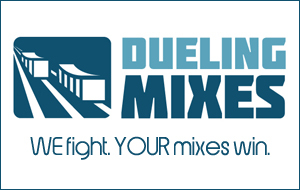 Even in a less-than-ideal mixing environment, you can get good mixes. You just need to know how to compensate for any problems your system brings to the table. This is a long learning process, but it’s well worth it. Let me know what you think by leaving a comment.